Designed and tested specifically for track day enthusiasts and for drivers who demand the utmost performance from their cars, these kits offer superlative performance for both normal driving and demanding track day sessions. 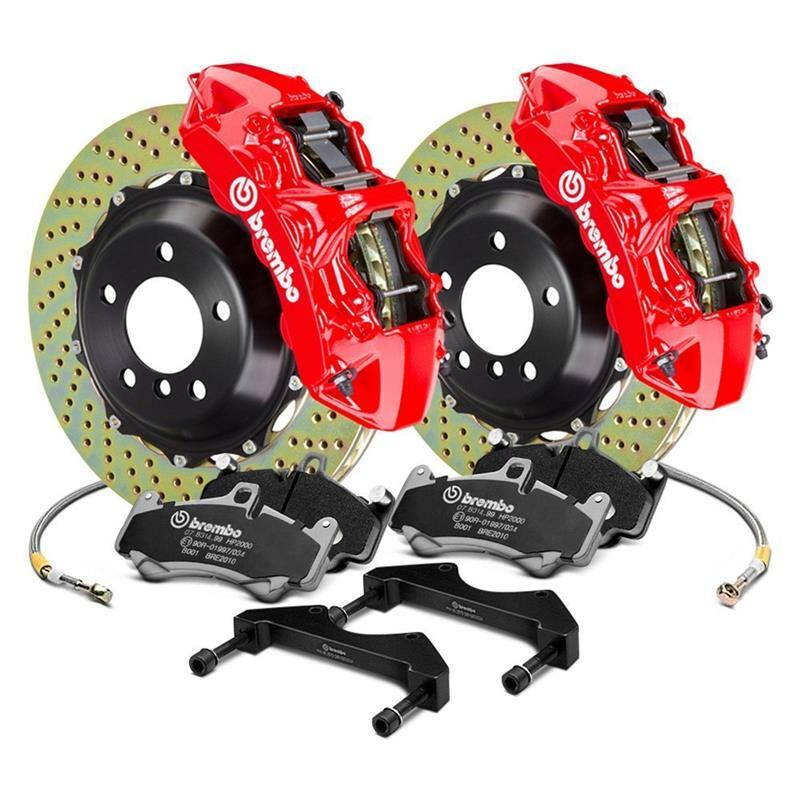 Brembo kits consist of cross-drilled or slotted ventilated, one-piece or composite discs and aluminium calipers with 4, 6 or 8 pistons; a complete set of high performance pads; metal-braided hoses and high quality hardware. Braking systems consisting of motorsports-derived components offering levels of technology and performance without par on the market today and embodying the purest expression of Brembo’s state-of-the-art technology. The kit consists of aluminium calipers with opposed pistons which, depending on the car model and in increasing order of performance, may be composite, monoblock or even billet monoblock components, combined with cross-drilled or slotted one-piece or composite oversized discs. Brembo kits combine the best solutions available to offer the perfect solution for the individual characteristics of each model. The heart of the kit consists of aluminium calipers. These are also available as monoblock parts machined from a single billet of cast aluminium, which ensure outstanding rigidity and minimised deformation. The discs supplied in the kit, which may either be floating or one-piece, depending on the specific car model, feature an exclusive venting system that improves cooling capacity and increases resistance to cracking caused by thermal shock by over 40%. Cross-drilled and slotted finishes are designed and executed with meticulous precision. These holes or slots in the braking surface help dissipate heat and eliminate brake dust and gases. A set of high-performance brake pads with specific friction materials for each application, TÜV/DOT homologated metal-braided hoses, an adapter and high-quality fastener hardware complete the kit. Using radial-mounted fixed calipers together with oversized discs gives the system greater braking torque and superior thermal capacity. The result is a braking action that is noticeably more immediate and decisive even in normal road usage, and is extraordinarily powerful and consistent under the repeated loads of track use. Fixed calipers improve the durability and efficiency of the system: the opposed multiple pistons act on the pads with more precision, due to the smaller piston diameter and the reduced pressure exerted on each individual piston, while the greater overall surface area between the pads and pistons results in more uniform friction surface wear. The superlative stiffness of the calipers and the metal braided hoses reduce brake fluid absorption. The result is improved, more stable brake pedal pressure, making it possible to modulate braking force more precisely and enhancing pedal feel. Featuring a hat in aluminium alloy, the oversized floating disc system reduces unsprung mass (for improved handling) and thermal stress. The mounting system is engineered to permit a greater degree of both radial and axial float. This characteristic, together with the greater dimensions of the braking rotor surface, improves the dispersion of the heat generated by the repeated, intense thermal stress that the discs are subjected to, for consistent braking performance and pedal feel even after numerous laps on the track.